It’s always a joy to arrive at this time of year with all the fun holiday traditions such as decorating a tree, hanging lights, baking yummy treats, listening to Christmas music, reading special Christmas books in front of a cozy fire at night, going caroling, selecting just the right gifts for loved ones, and enjoying the special church activities that accompany the Christmas season. I just love how the whole country (and beyond!) takes the entire month to celebrate Christmas! Though not everyone does so because they are celebrating Jesus’ birth, it is still His incarnation that is the underlying foundation for why we even have this holiday. How fun to spend a whole month engaging in joyous activities and traditions because of our Savior being willing to step down out of heaven and become a little baby…so that He could grow up to be the One who would give His life to redeem broken humanity! One of my other favorite holiday traditions is taking time out of our busy life to sit quietly and reflect on this past year; the memories, the changes, the growth we have experienced…and then to share them with all of you in our annual Christmas letter. It does my writer’s heart good to put things on paper and make the effort to stay in touch with people we care about! I hope you know that you are important to us! 2017 has been a full year bursting at the seams with the busyness that comes with having four little boys ages 4 and under! “Never a dull moment” would describe our lives well! Silas Andrew joined our crew on March 22 after another smooth home birth (for which we praise the Lord!). He is our first redhead and has the cutest smile! Silas’ favorite place to be is in Mommy’s arms, although he is getting better about playing independently or with his brothers now that he can crawl. With two teeth to his name, he loves to eat food he can pick up and feed himself. Nighttime sleep training has had its ups and downs with this little fellow, but I think we have finally made it into smoother waters! It’s super fun to watch Silas’ personality start to emerge and to hear all the adorable baby babble that accompanies this stage! Adoniah Wesley is our very active 2-year-old who is full of zest for life and has a knack for getting into mischief whenever possible! He is fascinated by all things firetruck, tractor, or train related. He loves to play outside, enjoys being read to, and never wants to be left out of anything. His verbal skills have taken off over recent months, and he makes us smile all the time by the way he phrases sentences or pronounces words. After finally mastering his colors, Adoniah is now learning how to count and to go potty like a big boy. He is also still working on learning to obey and play kindly with his brothers. We are so thankful for our cheerful Addy Boy and the enthusiasm, wiggles, and giggles with which he lives life! Josiah Daniel is now 3 1/2 and developing a genuine spirit of compassion and sensitivity for others that is neat to see! He has a nurturing soul that gravitates towards babies and animals, loves to make cards for people out of the blue, and is full of affection for his parents. This sweetness is tempered by a strong stubborn streak coupled with an emotional personality that makes our little boy a challenging one to parent at times, but we are learning together! Josiah loves to turn toy people, toy animals, and even his food into characters that have long, drawn-out conversations with each other as his imagination dreams up stories for them all. I suppose that is a natural by-product of being the book-worm that he is! JoJo Bear thoroughly enjoys his preschool work and is making great strides in simple academics. His favorite activity continues to be cooking! He also really looks forward to AWANA Cubbies club every Wednesday night at church. Watching his understanding of spiritual matters awaken has been a true joy! Isaac Nathan is growing up so fast as the oldest of our brood (age 4-almost-5)! Tall and lanky, he no longer needs a nap most days, loves to play grown-up board games, and has just started to take off with reading! He is my right-hand helper, always quick to run errands throughout the house for me (gotta use all that energy profitably, right?!) or to help play with Silas, whom he dotes on, while I prepare a meal. Watching his responsibility and thoughtfulness grow this past year has been a blessing! Isaac thrives on being outside and continues to demonstrate remarkable creativity with various building projects, whether they be block towers or pretend houses in the back yard. He is especially quick to grab his toy tool kit and tag along with Daddy or Grandpa whenever there are real construction projects underway! He is making good progress in our homeschool lessons and has a genuine love for the Bible. Nathan is now in his third year as the pastor of Faith Baptist Church and is thankful to have a new assistant who was hired in September to help shoulder the load! Nathan has spent a lot of time preaching verse-by-verse through the books of John, Philippians, and Revelation during our weekly church services and Bible studies as well as teaching on the topics of ‘systematic theology’ and ‘prayer’. 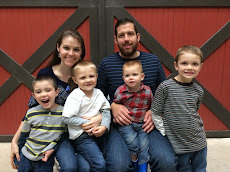 In addition to studying for sermons, Nathan also spends much of his time shepherding the flock by meeting with those who need pastoral care/counsel and visiting folks in the hospital or in their homes. When not engaged with church work, there is always plenty to do around the house and farm! After finishing the boys’ quadruple bunkbeds in February, Nathan’s next project was to install a shower in our guest bathroom by building out part of the walk-in closet to accommodate this addition. (While he was at it, he also replaced the sink, toilet, and floor for a completely remodeled look!) He got the shower operational just in time for my mom’s visit in March when she came to help with Silas’ birth! Nathan also took charge of the family garden as usual during the spring and summer. His latest task has been finishing a fence on part of our property where future livestock will graze. I am so thankful for my husband’s amazing handy-man skills, and look forward to the kitchen remodel we have planned for 2018! My days continue to be filled to the fullest with the responsibilities of home and family, the music and children’s ministries I help with at church, and the small business I operate. Homeschooling has been kicked up a notch this year with Isaac now doing more kindergarten level work and Josiah soaking in the preschool learning like a sponge. Bible, math, and language arts are the main subjects we make time for each school day, but we also incorporate some art, sensory play, and simple science as we are able. Reading LOTS of books is a normal part of our daily rhythm too…which we all really love! Mothering four little people with all their many needs and the constant training that is part of this season has been incredibly challenging…and humbling…and joyous too! I am truly thankful for the privilege of staying home with my brood and investing so fully in their lives. I also find great joy in hosting people for meals and game nights on occasion, as well as leading a young wives’ Bible study. As an Ambassador for Plexus Worldwide, the nooks and crannies of my time are filled with researching health topics and matching the needs customers have with the natural supplements we offer. I have learned and grown so much through this business endeavor! This past year has been full of multiple travel experiences for our family, which are always a special highlight! In the spring, Nathan and I enjoyed a restful few days in the heart of Ohio’s Amish country for our annual anniversary get-away where we shopped, fished, and ate like kings! Over the summer, we took a trip with our church to see the incredible Ark Encounter in nearby Kentucky as well as spent a fun-filled week of vacation in Branson, MO with the Britton clan. 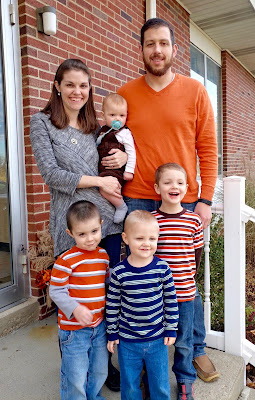 We made several trips north to Nathan’s parents’ for a soccer camp mission trip, a Bible conference that Nathan preached, and other family gatherings. In the fall, we enjoyed a visit from my parents during which time the boys and I accompanied them to Cincinnati to visit relatives and then drove to see the Ark again! Lots of special memories were made! Nathan also made a quick trip back to New Mexico for a good friend’s ordination into the ministry. As 2017 comes to a close, we praise God for His many blessings and the grace to live each day. We hope you all have a Merry Christmas celebrating the Savior and a Happy New Year living for His honor! Our home is always open if you ever want to come for a visit!